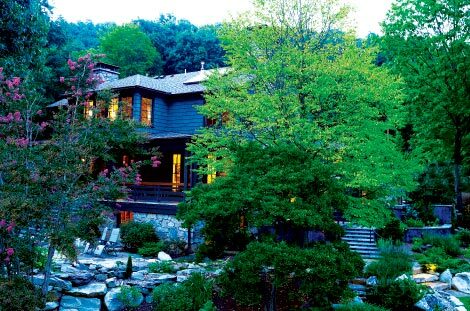 Asheville’s got this gravitational pull,” says Michelle Farago, sitting on her back porch overlooking a lush hillside landscape. The promise of sunnier days to pursue outdoor activities and a family-friendly vibe lured her and husband, Paul, from Portland, Oregon, to raise their children. For Michelle, who’d lived here before heading west to study chiropractic medicine, the pull was specific: She wanted to live in North Asheville. In this coveted corner of the city, the Faragos didn’t fall for a stately colonial or Spanish-style manse along Kimberly Avenue or an arts-and-crafts charmer in Norwood Park. Instead, they chose a circa-1940s home they weren’t convinced had ever been a true beauty. The inherent challenges of renovating weren’t lost on the couple, who’d completed several remodels on their own. However, the scale of this project was especially ambitious considering their son, Sam, was just 18 months old and daughter, Eleni, was on the way. At the suggestion of Paul’s brother-in-law, they sought the guidance of Jim Samsel of Samsel Architects. “The question for Jim was, can this house be brought back to its potential, which it may never have realized in the first place?” Paul says. The trio inspected the property, and when Michelle and Jim found themselves making similar suggestions for the makeover, they knew their visions were simpatico. After a carefully planned, two-year renovation that took the home down to the studs, the abode is handsome with cedar shingles outside and calm tones and spacious rooms appropriate for an active family inside. The process involved transformations large and small. For instance, a stairwell to the basement that clogged a corner of the kitchen was relocated to a side addition,allowing for the creation of a mudroom. Most of the rooms retained their dimensions, with the exception of a tiny bathroom and bedroom that were reconfigured to create an updated bath and sitting room adjoining the master bedroom. “Moving walls was beyond my risk tolerance. They had more vision in that way,” says Michelle of Samsel’s team. Subtle refinements included expanding door widths and heights to make passageways more welcoming. The dining room and kitchen received a dose of character with the addition of board-and-batten walls. Interior designer Traci Kearns of Alchemy Design Studio kept the home’s palette natural with soft creams and wood tones that provide a warm, but fresh, aesthetic. When the couple moved from the City of Roses, they brought cherished pieces of art and furniture. In the living room, large glass fruit sculptures by Joey Kirkpatrick and Flora C. Mace stand atop the custom entertainment console. On another side of the room, a rocking chair crafted by the late Sam Maloof, a Lebanese furniture maker from California, sits beneath a more recent acquisition from Brevard painter Werner Haker. The couple called upon Kearns to navigate the local art world. “We like to combine different artists,” Paul says. The remodel extended outdoors as well. The covered back porch was closed in by a half wall of blast rock and old casement windows. “It was kind of awful,” says Michelle. “It just begged to be turned back into an open porch.” The plan was accomplished by removing the windows and replacing the rock wall with wooden rails. French doors took the place of windows in the dining and living rooms to create a flow between the expansive porch and indoor gathering spaces. Relishing their escape from the cloudy skies of the Pacific Northwest, Michelle and Paul soak up as much outdoor time with the kids as possible. The revived orchard and vegetable garden serve as natural playgrounds for the kids. “When the peas come up, Sam says he’s going to the peas café,” says Paul about their trips to the garden.